Our 24 hour pet hospital is located in Stone Oak and serves the San Antonio area and all of South Texas. When you have a pet emergency, seconds count. We want you to know, we’re ready. If your pet has a condition that requires a specialist’s expertise, we’re ready for that too. 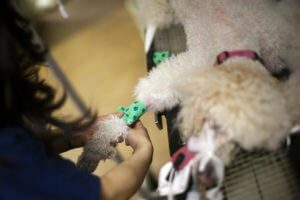 Our experienced veterinarians, vet technicians and support staff work closely together to provide the comprehensive, compassionate care your pet needs and deserves. Emergency: In an emergency, call ahead to your BluePearl vet and let us know you’re coming. No appointment is necessary for our emergency vet. Learn more about your emergency visit. 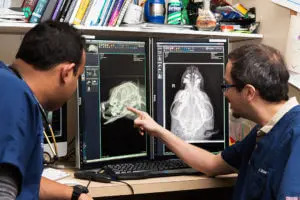 Specialty Care: Our veterinary specialists work directly with your primary care vet to understand your pet’s condition and develop the appropriate treatment plan. Visits to our specialists are usually by referral from your primary vet and by appointment. Learn more about veterinary specialists. People and their pets come from all over the region to visit our Stone Oak animal hospital in San Antonio. For sick or injured animals, the ride to BluePearl Stone Oak is a journey to highly skilled care. If a 24 hour pet emergency turns into surgery, take comfort in knowing that our board-certified specialists are there for you. Stone Oak routinely does tracheal stenting and total hip replacement. The diverse specialties in our 19,000-square-foot hospital allow for more collaborative care. We have advanced diagnostics, including MRI, CT, digital radiology, ultrasound and fluoroscopy. We also have ventilator support. BluePearl Stone Oak was formerly known as South Texas Veterinary Specialists and Emergency Pet Center.